The Order of the Daughters of the King (DOK) participated in a Quiet Day retreat on Saturday, March 25, 2017. The retreat was held at the St . Anthony Retreat Center in Kalihi. It is a place of peace, quiet and calm for those seeking to renew themselves spiritually. The St. Nicholas Chapter hosted the event, and women from several chapters and different churches were in attendance. Pictured at top (in no particular order): Susan Anderson, Judy Martin, Dorothy Pierce and Karla Bee from The Cathedral of St. Andrew; Evangeline Barney, Adele Thomas, Simeona Gestone, Angustia "Angie" Hamasaki and Jeanne Inouye from St. Timothy's; Sandra Braham, Tusi Mayer and Delia Moore from Holy Nativity; Shauna Jones, Kala Holden, Brandy Donaldson, Brianna Anderson, Becky Fitzgerald and Luella Windisch from St. Nicholas. At 9:00 AM the DOK Assembly President, Shauna Jones, opened the day. The Rev. Ernesto Pasalo began our spiritual journey with prayer, reflection and Celebration of the Eucharist. He also taught us the song " Sanctuary ." We enjoyed it so much we sang it twice. After Eucharist the talented "Good and Bad Players" Adele, Shauna, Brandy and Tusi, presented a skit "Neglecting Word and Prayer" (shown below right). From the laughter in the room it was obvious the skit resonated with the audience. It was a humorous look at how we start with good intentions in the morning. Then the problems of the day trip us up. Slowly, easily and with great excuses we put God and prayer off to the side. The rest of the day continued the theme of finding the importance of "The Secret Place", the place you go to be with God, meditate and pray. The study was based on scripture that emphasizes God's promise to be with us always. Many of us walked quietly around the grounds of St. Anthony's Retreat Center. There are various sites on the lush one hundred-twelve acre property; Hillside Stations of the Cross, meandering outdoor walkways and a meditation grotto provide a contemplative backdrop. November 1, 2016, is the in-gathering day for the Endowment Fund. Designated as All Saints' Day, it is a day when we remember all the saints who have come before us so this is the perfect day to collect for this fund. 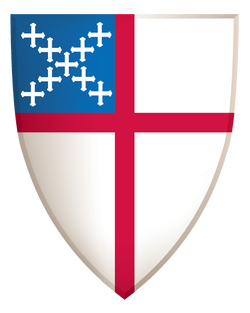 The Endowment Fund was established in 1928 to further the work of the Order. The resolution that was then presented read in part "...Fund to be a permanent trust fund. It shall be increased by requests, thank offerings, memorials and other special gifts from persons believing in and desiring to forward the objectives of The Order of the Daughters of the King®." There are many reasons to contribute to this fund. Contributions can be made by online donation individual mail, or bring the completed form with your check made out to The Order of the Daughters of the King, Inc. You may give your Endowment Fund contribution to the DOK Hawaii Diocese Assembly Treasurer at the Fall Assembly, October 30. The DOK Treasurer will mail all donations to the National Office for you. As a donation reaches the National Office, either by mail or online, it is recorded into the Book of Remembrance. The Book of Remembrance is taken to each Triennial Gathering and is placed on the Triennial altar. Contributions do not have to be only in memory of someone who has passed away. Special contributions can be made in tribute, in celebration of birthdays or anniversaries, or in thanksgiving for a Daughters dedication toward the Order. * From the The Order of the Daughters of the King National website adapted to the Hawaii Diocese Assembly. 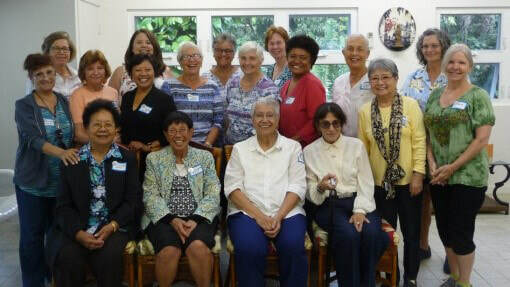 Mana'olana, which means "hope" in Hawaiian, is the name of the newly installed All Saints' chapter of The Order of the Daughter's of the King (DOK). 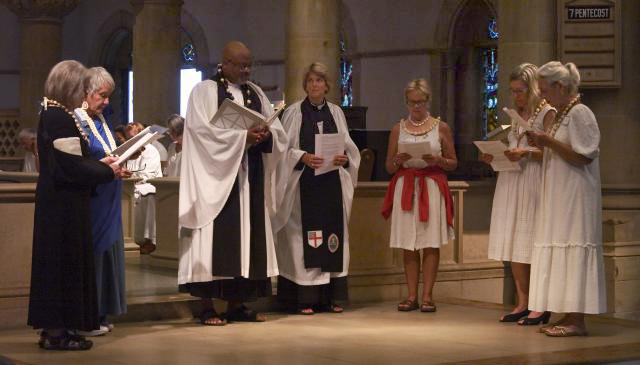 The ceremony took place during the 9:30 service this past Sunday, March 1, with members being blessed and welcomed by Shauna Jones, a board member of the diocesan DOK and chair of the St. Nicholas Chapter on O'ahu. The new Queen Emma chapter, Na Kaikamahine 'O Kaleleonalani 'O Ka Haku, of the Hawai'i Diocese Order of The Daughter's of The King (DOK), was instituted, admitted and installed on July 27, 2014, by the Rev. Walter Brownridge, Dean of The Cathedral of St. Andrew, and DOK Assembly President, S. Kala Holden. Afternoon Tea and a light buffet were offered in the Von Holt Room of The Cathedral prior to Evensong and DOK induction ceremonies. Members from Bishop's Daughter's-At-Large, St. Timothy's and St. Nicholas chapters were also in attendance. Queen Emma chapter members pictured above woth Dean Brownridge and the Rev. Susan Sowers are, Rosemary Thompson, Susan C. Anderson, Judy Martin and Cassandra Pinnick. 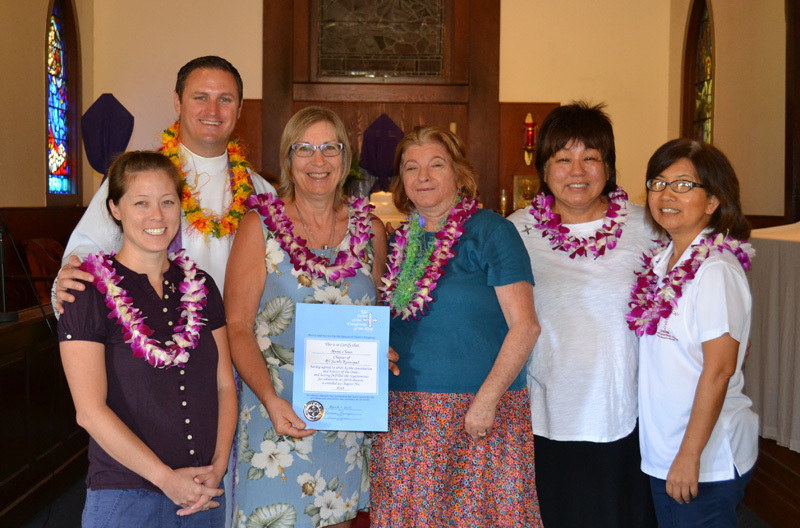 The Board of the Hawai'i Diocesan Assembly of the Order of the Daughters of the King® (DOK) installed the officers of the Diocesan Assembly Board, on January 12, 2014, at Christ Gathering Place in Aiea during the 8:00 a.m. service at St. Timothy's Episcopal Church. The Right Reverend Robert Fitzpatrick was the celebrant. The Daughters of the King's Assembly Board are: Luella Windisch, President; Kala Holden, Vice President; Vicki Millard, Secretary/Treasurer; Cynthia Carson, Daughters at Large (DAL) chair; Shauna Jones, St. Nicholas chair.. The Assembly Board was supported by Daughters in other churches that came for the installation. Pictured in the photo: Back row L-R: Karen Huston, Vicki Millard, Luella Windisch, Cynthia Carson. The Rt. Rev. 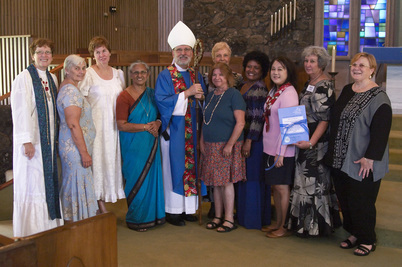 Robert L. Fitzpatrick ,Bishop of the Episcopal Diocese of Hawai’i; Front row L-R: Kala Holden, Shauna Jones, Skippy Sweet, Jeanne Inouye, Simeona Geston. The DOK is an order that offers a deeper walk with Christ through a commitment of prayer and service to our church and community.